Hi everyone! I hope most of you have almost finished their finals – I’m almost done and I’m so looking forward to summer and travelling! 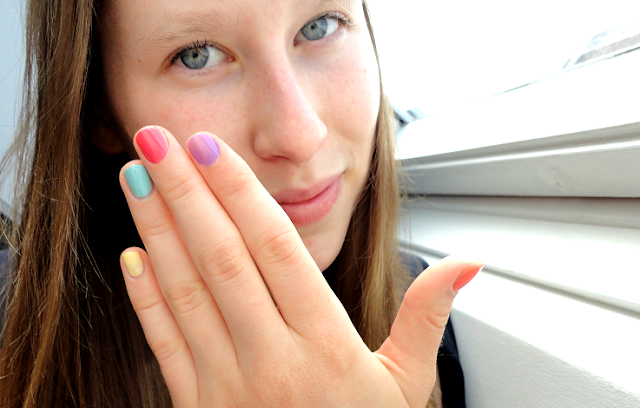 Today I’m going to show you my favourite summer nail polishes. I'm such a sucker for Essie nail polishes, but I did my best to select a few others too! Lately I’ve been really into bright and pastel colours, sometimes even neon nail polish. 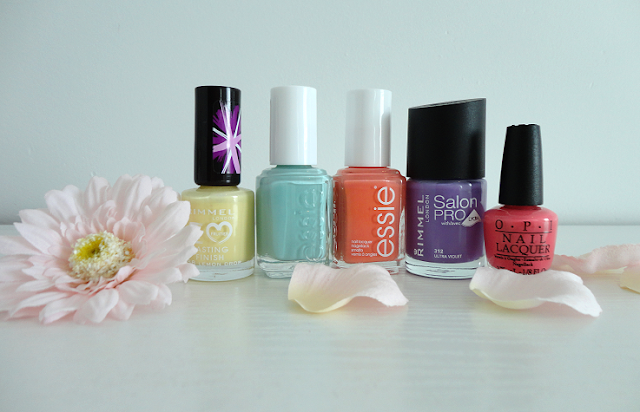 I think bright colours are awesome for warm summer days so that’s why I’ve chosen a few of my brightest shades. The first shade is Essie Tart Deco! It’s a soft, yet bright orange that lacquers very nicely. It’s very pretty on hands and feet – I tend to apply this on my toes when I’m wearing sandals. 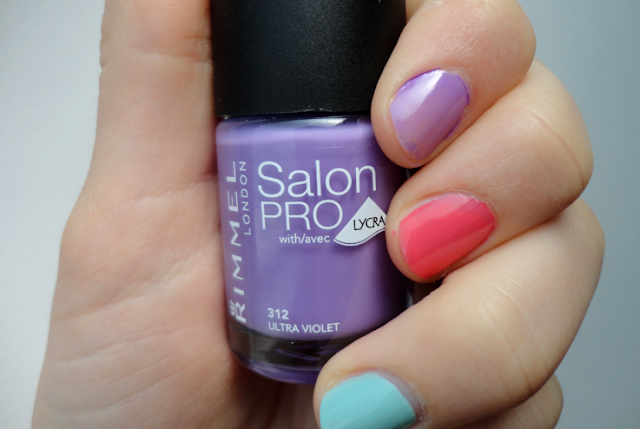 The second nail polish is Rimmel’s Salon Pro Ultra Violet! This was one of my best friend’s presents for my birthday and as soon as I saw it, I fell in love with the colour! I have two Rimmel nail polishes featured in this post, but they are both very different – read on if you want to know why, haha. The brush of this nail polish is incredible, I like it even better than the Essie ones and they are already pretty good! It seriously lacquers so nicely and lasts as long as an Essie nail polish – which is about 3-4 days if you’ve applied a top coat – and they are a little cheaper aswell! The next shade is OPI Suzi’s Hungary Again! It’s a nail polish from the Centrale Europe 2013 collection. It has a glossy finish and I’ve heard some people say that there’s a little shimmer in it. I haven’t noticed it though, and it’s my sister’s nail polish which means she wears it more often, but she hasn’t noticed anything either. Weird haha! I love the consistency of this nail polish though *tiny rave*. It’s very thin but yet it layers nicely! How awesome does that sound?! I’ve never applied a better nail polish in my entire life. I swear. Essie Mint Candy Apple is one of the most sold Essie nail polishes! 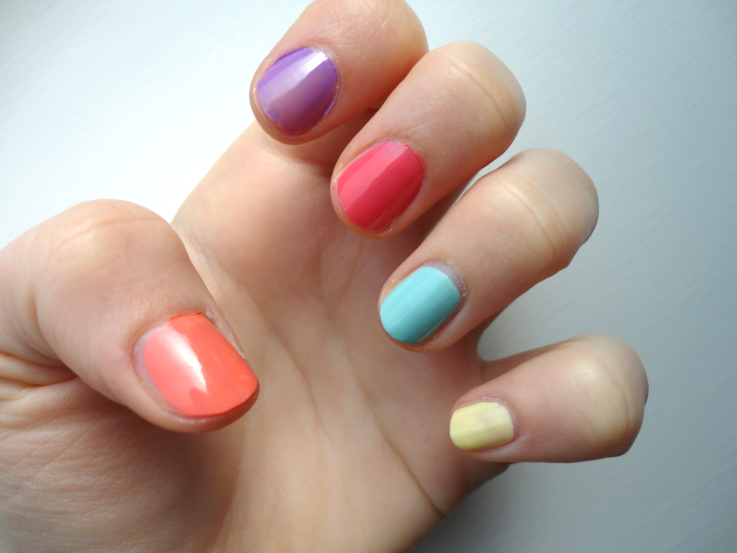 If I had to pick an ultimate summer favourite – it would be this nail polish! To me it’s an ocean blue colour but there is some green in there aswell, though it depends on the lighting. The best thing about this nail polish is that it dries super fast. Some people find it streaky, but I think you definitely need at least two coats to see the colour in its true opacity. I once applied six coats of this nail polish – I think I was a bit bored haha – and seriously, it lasted me an entire week without a single chip…till I decided that I would pull at the nail polish myself. Classic bored study problem during exams. 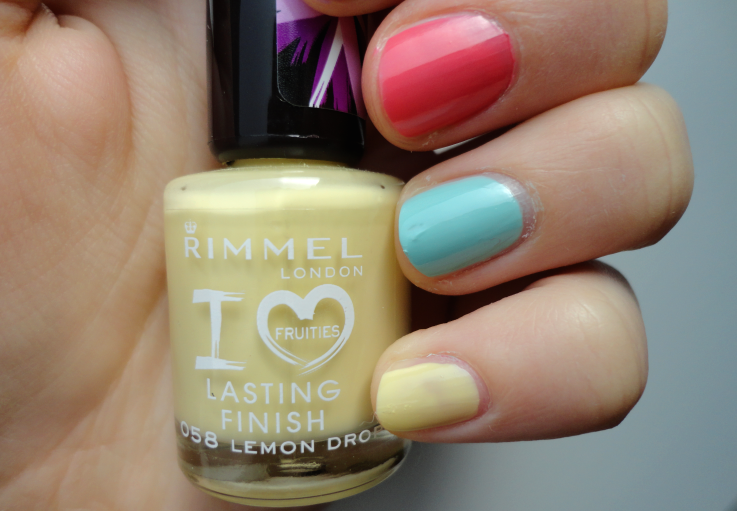 The last colour is Rimmel’s I <3 Fruities Lemon Drop. Okay and here’s the difference: remember that I told you the Rimmel Salon Pro lasts long and lacquers nicely?! Well this one is HELL. The colour is absolutely gorgeous but it’s such a pain applying and noticing that some nail polish bits have already started to chip after a few hours. Rimmel are you serious?! I really don’t like applying this nail polish, but yes it’s a very pretty shade. That’s it! These were my summer favourites. Except for the Rimmel Lemon Drop one, all these nail polish lacquer very nicely and look amazing. No streaks! I hope you’ve enjoyed my post! If you’re curious, I blog at scribblesofvalerie.com. Thank you for reading my post and thanks to Becky for having me on her awesome blog! Have a great day! Lemon drop is a lovely colour! And mint candy apple is definitely on my wishlist! Those are such pretty colours for summer! I love these colours together. They all look really summery. Lemon Drop & Candy Apple are my favourites, they are beautiful! I love that yellow color! It's so soft and nice! I love the opi color the best! but they are all beautiful! Such a shame for the quality of Lemon Drop as the colour is soo gorgeous!! Northern Ireland beauty spas have become tremendously popular of late for several major reasons, the beauty and spa deals northern ireland health aspect, plus the wonderful relaxing settings that many of N.Ireland top spa’s enjoy. Cools colours ane really well done. I terrible at painting my nails.